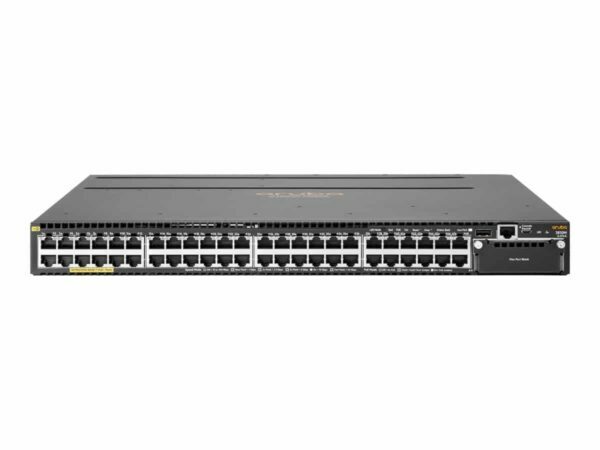 The Aruba 2930M Switch Series delivers great performance and value and requires no software licensing. The Aruba 2930M Switch Series Optimized for the digital workplace with unified management tools such as Aruba ClearPass Policy Manager, Aruba Airwave and Aruba Central it delivers a great performance, security, and ease of use for enterprise edge, SMB, and branch office networks. The Aruba 2930M Switch Series Provides optimal configuration automatically when connected to Aruba access points for PoE priority, VLAN configuration, and rogue AP containment, also enables automation of network operations, monitoring, and troubleshooting. With Aruba ProVision ASIC The Aruba 2930M Switch Series enables the mobile campus with low latency, increased packet buffering, and adaptive power consumption and Supports up to 740W of internal PoE+ power and can easily scale to 1440W with choice of power supplies. The Aruba 2930M Switch Series includes security protocols such as 802.1X, MAC and Web Authentication, its Powerful multilevel-access security controls include source-port filtering, RADIUS/TACACS+, SSL, port security, and MAC address lockout. The Aruba 2930M Switch Series supports Aruba Airwave Network Management software provides an on-premise network management platform for wired and wireless network devices.